How can course instructors encourage their online students to learn? In this post I’ll describe how course instructors can foster learning in their online classes. I’ll also examine how the needs of online learners differ from students of traditional learning and how instructors and institutions can support non-traditional students. This is the third post in a four-part series on strategies for online instruction. In post one and two I introduced the Online Learning Support Framework that divides an online course by weeks into three distinct learning phases. In a twelve-week course for example, phase one comprises weeks 1 to 3, phase two weeks 4 to 8, and phase three weeks 9 to 12. The model describes the learner’s level of self-direction and prescribes the type of academic support required within each phase. The Online Learning Support Framework is a model that can help educators understand the distinct needs of the online student. Research suggests that students taking online classes require a sense of self-directed learning (SDL) (Song & Hill). Yet how can an online learner acquire and develop these skills? This model applies the concept of self-direction and suggests how instructors and institutions can support and guide students through each. In the previous post I described phase one where the learner was dependent, subsequently requiring a high level of academic support. Provided the student did in fact receive the support as needed in phase one, then he or she will be equipped to engage with the course content and be ready to learn in phase two. And what about the Teaching? In phase two there is a considerable amount of teaching that needs to occur, along with a high level of relational support. Relational in this context means personalized support. Students do not require hand-holding; they are past the ‘needy’ phase but they do require feedback, reinforcement and acknowledgement for the time and energy they have already invested. It is the personal connection and encouragement that is so very needed in online learning. It is the instructor’s encouragement that can make the difference between whether a student is successful or not. Yet how can the instructor bridge the virtual divide of time and space to encourage and motivate? Encouraging can take many forms, though encouragement within this model means that instructors encourage and are ‘there’ for learners providing support on the sidelines, yet are ready to step-up when needed. Students need to know that someone is ‘there’ – someone committed to their learning. Below I’ve listed several strategies that have great potential to encourage students. I can personally vouch for the strategies listed here – they work. Most have been used by the very best of professors that I had when completing online courses for my graduate work. I’ve also included one or two other methods identified in the research studies already referenced in this post. See resources below for details. Provide timely feedback on assignments. At the beginning of phase two, the student should ideally receive feedback on at least one individual assignment. This provides the instructor with the opportunity to make a connection with the student, thus encourage and motivate a student just at the point when the student is moving towards becoming an independent learner. This reinforces the student’s increasing level of self-direction. Respond to student questions within 24 hours. Doing so encourages focus and commitment – the student senses that someone ‘cares’. Include constructive and personalized feedback on assignments. Specific comments about a student’s work sends a message that his or her learning matters. Even if a grade is poor, constructive and supportive feedback from the instructor is appreciated. Craft a weekly message in the form of a text or video message to post to the course home page. Doing so demonstrates to students that the instructor is indeed involved and engaged in the course. Acknowledge academic challenges. If a given week is challenging academically, provide encouragement and suggest additional resources that students might find helpful. Comment strategically within discussion boards – making note of insightful or notable comments made by students. 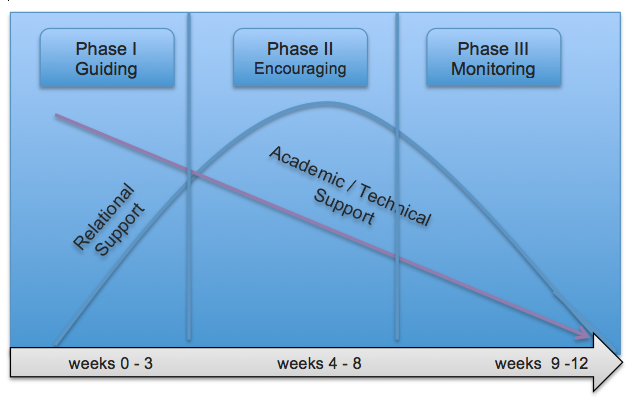 Notice from the image of the model below how the need for relational support peaks around the middle and then declines towards the end of phase two. As students become more confident with the course and its content, the need for encouragement in the form of relational support declines. Learners are learning how-to-learn, how-to use the resources, and are becoming less dependent on the instructor and the institution. Easy access to resources that students will need as they become further involved in the course including: library resources, writing skill support and time management instruction. 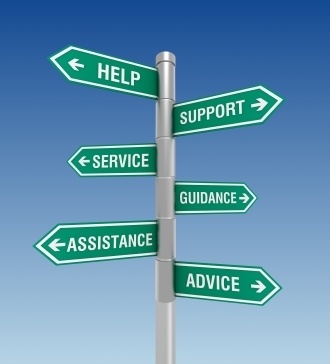 Career service support and/or counseling. Online students are not unlike traditional students in their need for encouragement. But online learners need encouragement and support at the right time and the right place to keep them on their path to learning. Check back next week as I close this series with a review of phase three – the need for instructors to monitor and guide students to successful course completion. Song, L. & Hill, J. A conceptual model for understanding self-directed learning in online environments, (2007). Journal of Interactive Online Learning, v 6 (1). Very well written article. I am in the education field (www.tenpointacademy.com) and insist that my students take lot of practice tests and stay motivated. Keeping their motivation and spirits up can be challenging, so we have come up with other ways to keep them engaged and perform their best. Thanks for the research and vivid article. This is a great article. I also think the number one motivation for students is actual engagement between pupil and teacher. I have been through school and many of my peers and I agree that proper face to face courses encourage involvement and interaction which provides the best results. I like the way you have used my PARS model. I would like to direct my students here so they can see a direct application of the model to an online learning setting. Excellent! Thank you Steve for commenting, so nice to hear from you! Great post, thank you for sharing this information with us! I’ve taken a few online courses and it could be a challenge sometimes to keep up with all of the work and be self motivated, but these are great tips to help keep the student motivated through out the course. I found another blog post that also gives some tips on how to create an interactive learning environment if you’d like to take a look! Learning Environment | online learning insights <Loved it! I am anxious to read your fourth post from this series outlining teaching strategies for online instructors that address the unique needs of online students. Have you posted yet? Very informative. Thank you. Thank you for your valuable writing, it is really very useful. I hope for many more valuable posts from your great writing. assignmentsweb. Thank you for your broad thinking. Your post is really helpful and valuable to the readers.